Apple says Psystar knowingly violated its copyrights and license agreements and induced customers who bought the OS X-running Open Computer to do the same. Because of that and the resulting damage that Apple alleges is being done to its brand, it’s asking the US. District Court for a permanent injunction that would bar Psystar from selling any more hardware with Apple software. And it wants Psystar to recall every Mac clone sold. Those details are contained in the complaint Apple filed with the U.S. District Court’s Northern District of California. Apple filed its suit against Psystar on July 3, though word of the legal action first came to light earlier this week. 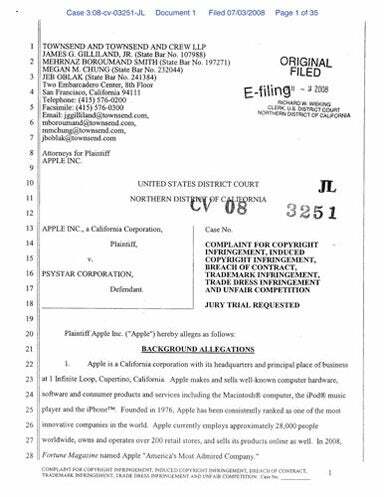 Now the text of Apple’s complaint is available online. (You can download it for a modest fee.) And the 35-page filing—a 16-page complaint plus 19 more pages of evidence—offers some insight into the basis of Apple’s allegations and the arguments it plans on making in court. Miami-based Psystar announced in April that it would sell PCs capable of running Mac OS X. Customers could order the desktop—originally called Open Mac but later renamed Open Computer—and install OS X themselves, though Psystar, which charges $155 to install the OS itself, encouraged customers to order hardware with OS X 10.5 preinstalled. In June, the company added a cloned version of Apple’s Xserve to its offerings. Apple says that’s a violation of its end-user license agreement, a copy of which is included with Apple’s July 3 filing. Specifically, Apple cites portions of the agreement in which users agree “not to install, use, or run the Apple software on any non-Apple labeled computer or enable another to do so.” Apple contends Psystar’s owners are aware of the end-user license agreement—in an InformationWeek article from April, a Psystar employee is quoted as challenging the validity of the license agreement—and that installing OS X on its Open Computer constitutes a breach of contract. Further, Apple contends that Psystar encouraged other users to break the license agreement by telling them to install OS X on non-Mac hardware or doing it for them. And Apple further alleges that Psystar “makes copies of, and offers to customers for download from its website… ‘updates’ to the Leopard software that are either direct copies of Apple-generated updates and/or unauthorized modified versions” of those updates. Apple argues that the end result of unauthorized use of its software and intellectual property is damaging to its brand. And it takes great pains in the court filing to point out how valuable that brand is—Apple says it’s spent more than $3 billion since 1994 to promote the Mac and Apple trademarks and that the Apple brand consistently ranks among the 50 most valuable brands on earth by independent research organizations. In contrast, Apple cites user complaints about the Open Computer experience as well as Psystar’s changing physical addresses and its dispute with an online payment processor. Some other issues may have played a part in the timing as well. On July 2, the day before Apple filed its complaint, Psystar notified its customers via a blog post called “Business as Usual” that the OS X 10.5.4 update was available “for users who have run our 10.5.3 scripted installer or whose computers shipped with 10.5.3 Leopard.” A month earlier, Psystar had done the same thing with the OS X 10.5.3 update, this time making a scripted installer available for download. It’s possible that after those two instances, Apple felt it had enough ammunition to bring its case to court.